When combined in conjunction with massage therapy, cold and hot pain relieving products may provide fast acting, deep penetrating, and long lasting pain relief. Happy Head Foot Reflexology and Massage in San Diego has added this option to their list of services to help reduce pain for individuals suffering from back and neck pain. Massage therapy is a great alternative option for dealing with back pain, neck pain, and other ailments. 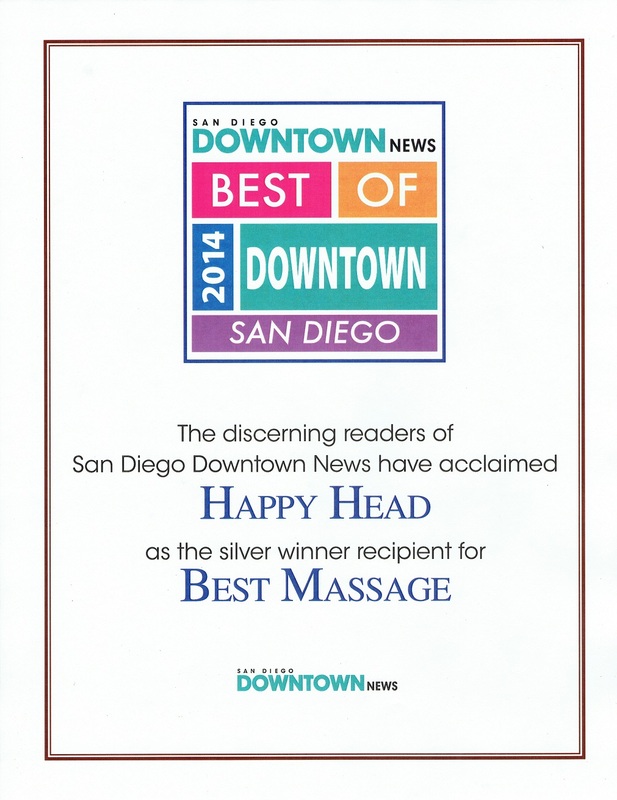 The Happy Head has become the premier place in San Diego to get a great massage without the spa prices. In an ongoing effort to improve on their services and help customers feel better, they have added an additional option to their menu that may be the quick fix that many have been looking for. 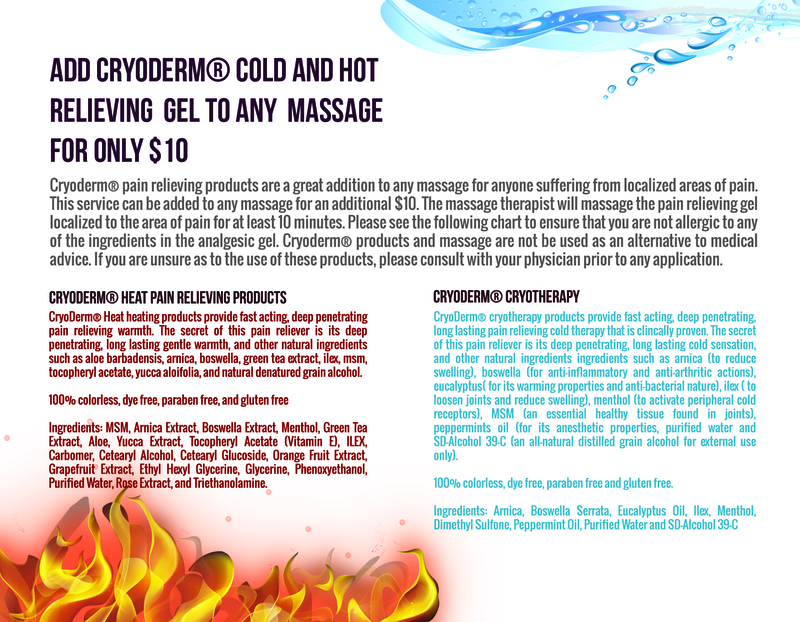 At the Happy Head customers can now add Cryoderm® Pain Relieving gel to any massage for immediate deep penetrating pain relief. When combined in conjunction with massage therapy, cryotherapy and heat relieving products provide fast acting, deep penetrating, long lasting pain relief. The cost of adding this service to any massage is only $10. The masseuse will massage the pain relieving gel localized to the area of pain for at least 10 minutes for immediate and long lasting relief. By visiting http://www.happyheadmassage.com/suffering-from-pain-heres-a-quick-fix/, more information can be found about these additional pain relieving options. 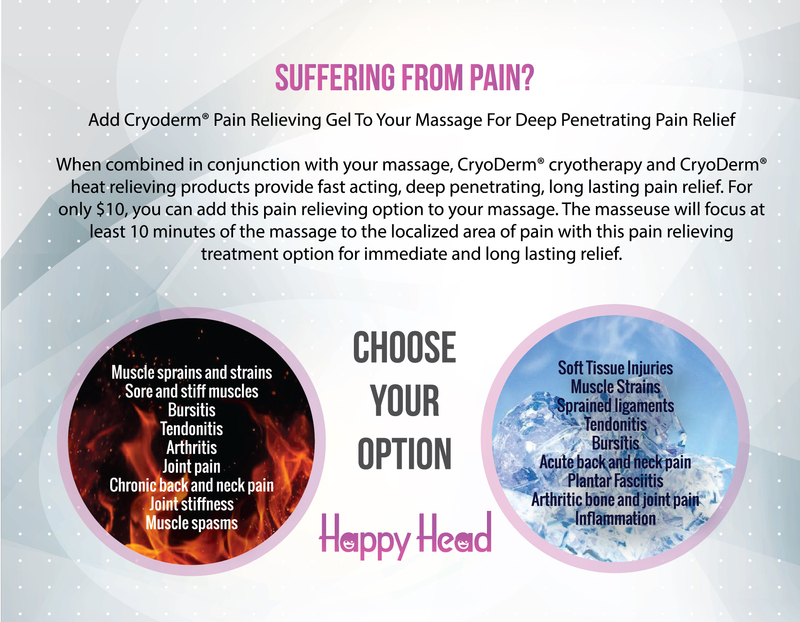 Customers have two great options to choose from to help eliminate their pain. There are cold and hot options. Cold options are generally used for soft tissue injuries, muscle strains, tendonitis, bursitis, acute back pain, inflammation and much more. The hot option is generally used for sprains and strains, muscle spasms, stiffness, soreness, back and neck pain, arthritis and much more. Adding this pain relieving option to the massage is very easy. Customers can book their appointment online at http://www.HappyHeadMassage.com/booking and just select to add this option when completing the booking form. They can also add the option when coming in for their appointment. Happy Head Massage in San Diego continues to change the massage industry. By eliminating the need for memberships, offering upscale spa services at a great price, and now offering fast and affordable ways to eliminate pain, the Happy Head has become the premier place to go for a great massage.